The Industrial Maintenance Systems Technology Diploma is designed for the student who wishes to prepare for a career as an Industrial Systems technician/electrician. The program provides learning opportunities that introduce, develop and reinforce academic and technical knowledge, skill, and attitudes required for job acquisition, retention, and advancement. Additionally, the program provides opportunities to retrain or upgrade present knowledge and skill. 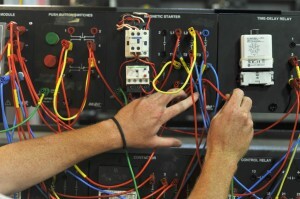 The diploma program teaches skills in Industrial Systems Technology providing background skills in several areas of industrial maintenance including electronics, industrial wiring, motors, controls, plc’s, instrumentation, fluid power, mechanical, pumps and piping, and computers. Graduates of the program receive an Industrial systems technology diploma qualifying them for employment as industrial electricians or industrial systems technicians.